Quantity Discount:Save when you buy 12 or more units. Size:4" x 2" x ½"
The Hydrosorbent 40 Gram units provides protection for cases containing guns, cameras, telescopes and musical instruments. Also, ideal for tool & tackle boxes and silver drawers - any small storage area. The mini canister contains 40 grams of silica gel in a compact aluminum canister that measures 4" x 2" x ½", about the size of a deck of cards. Protects 3 cubic feet of enclosed space and has an indicator window that has Blue silica gel that turns pink when saturated to give you a visual indicator of when this unit needs to be reactivated. Detailed instruction are provided on the outer package and embossed on the canister. We sell this product for humidity control for documents, precious metals and collectibles only. This product is NOT designed for any applications that include food or drugs for consumption. 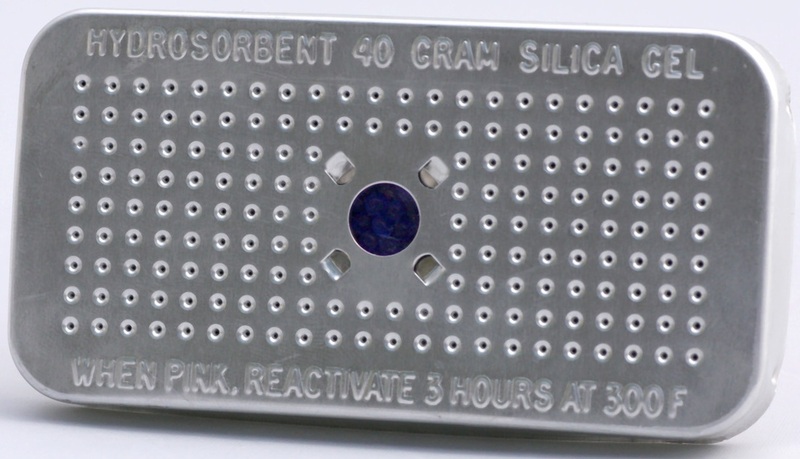 When the blue silica gel beneath the inspection window turns pink, reactivate as follows: Place the unit in a vented 300 degree F oven for at least 3 hours (or until the silica gel turns blue again).